BoothSaver™ 2043 Clear Matter Antistatic Equipment Film is used to protect paintbooth robots and equipment from overspray. This film is paint-shop safe, with self-extinguishing fire retardancy and antistatic properties that safely dissipate electrostatic buildup. This product is not self tacky, so it is easy to unroll and adjust position. 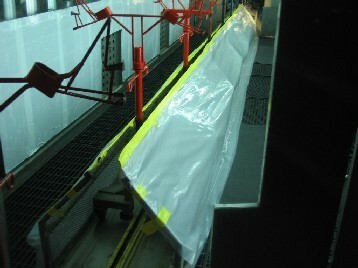 A typical use for this product is to quickly cover and protect the conveyor assembly and shroud. Use for conveyor shrouds and robot rails. Easily put in place and removed.